With four very experienced chess players playing in the Winter Quads, it’s no surprise that it was exciting. 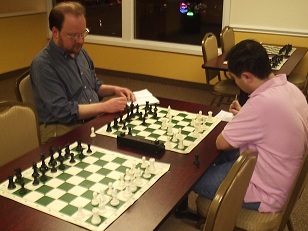 Leif Pressman, David Childs, Melvin Patrick, and Ian Harris fought to checkmate in these three rounds. In Round 1 Pressman took a quick point from Childs. Harris also won his match against Patrick setting the mood for the final round. In Round 3, Harris and Pressman played against each other in a grueling match. In a rare opening, Pressman blundered a pawn early, but Harris later returned the favor to head into an unclear ending. In the end, Harris made the final mistake allowing Pressman to emerge as the tournament victor! Congratulations to Leif Pressman!